SINGAPORE, 18 April 2013 – Having secured the backing of Coca-Cola Singapore in January this year, the Singapore Athletic Association (SAA) today welcomed another key sponsor in the form of a three-year sponsorship deal with sports apparel importer, Key Power International (KPI) Pte Inc, distributor of Brooks and 2XU, valued at close to half a million dollars. The deal, which will see KPI will provide the Republic’s top track and field athletes with apparel from Brooks and 2XU, will run until the end of 2015 and is worth around SGD$150,000 a year. Brooks, a leading running apparel, shoe and accessories company from the United States, will provide the Singapore athletes’ with tracksuits, shorts, running vests, collar shirts and round neck t-shirts, whilst leading Australian compression brand, 2XU will provide high performance compression shorts and body suits. At the sponsorship announcement media event held at the Singapore Sports School, some of Singapore’s most promising track and field medal hopefuls at the next Southeast Asia Games were on hand to show off the brand new kits they will be competing in for the next few years. Covering the 2013 and 2015 SEA Games, as well as international and local events, the deal will see the likes of national athletes like rising sprint star Shanti Veronica Pereira and long distance runner Mok Ying Ren compete in the striking new Brooks attire. The Men’s 4x100m relay team will be some of the first athletes to wear the new apparel, with the five-man squad scheduled to compete during the Nippon Sports Science University Athletics Meet in Japan next week. For the design of the initial batch of Brooks and 2XU Singapore athletics team kit design, the familiar red colour of the national flag will be the dominant colour for tops, including collared shirts, round-neck t-shirts and the competition tracksuit. To contrast against the red, the shorts, compression tights and tracksuit bottoms will be solid black in colour. 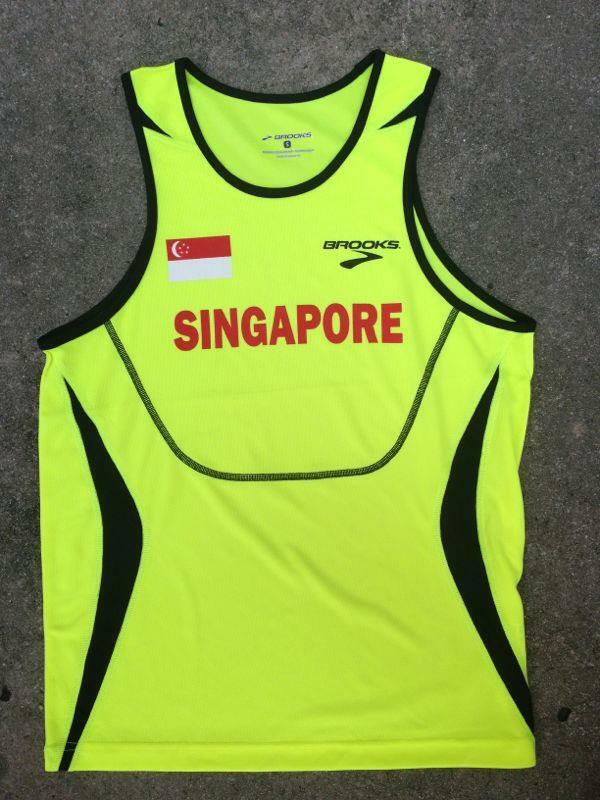 The only exception will be the Brooks competition singlets, which will be a striking fluorescent yellow. 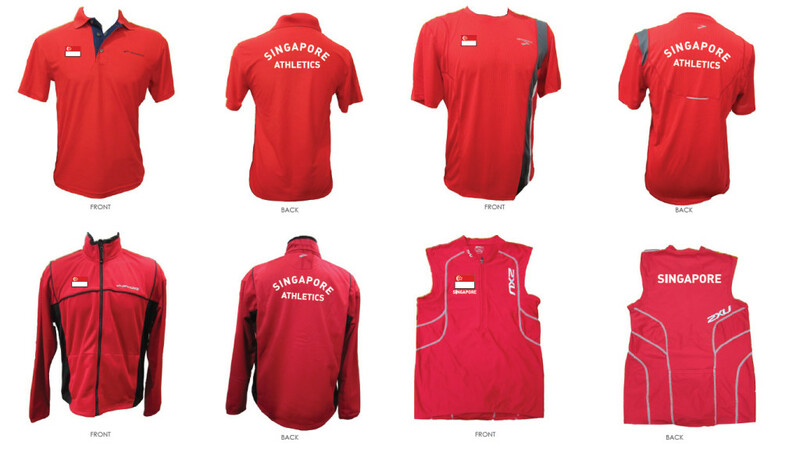 All the outfits will feature the Singapore flag on the front, with the words “SINGAPORE ATHLETICS” featuring prominently on the back. “KPI is delighted to be associated with the SAA through this three-year sponsorship deal, which I hope will be the start of a long and fruitful relationship. As a locally based company, we are proud to show our support for local track and field by offering Singapore’s top athletes with our top sporting gear. View the video Youtube playlist of this event here. Another design of the top our National athlete will wear. About Key Power International Pte Inc.
Key Power International Pte Inc is a Singapore based company established in 2006, for the distribution cycling, running and triathlon apparel. Founded by avid runners and triathletes, Key Power International aims to equip aspiring and elite athletes with the best possible gear and apparel for all their training and racing needs. About Brooks ® Sports, Inc.
2XU engineer products with the single minded goal of best equipping the athlete, so they feel more prepared, more lethal, more capable than anyone. As they put on the technologically sophisticated garments over their bodies they also put on an attitude, to be more than they ever have been, the perform beyond expectation. With 2XU technology a piece of the finely balance equation is in place to multiply human performance. This technology marks the beginning of a new era in sporting equipment. Our garments use intelligent physiological design, cutting edge performance fabrics and construction, derived from a race bred pedigree.